Charles Hall worked as a weather observer in the USAF in the mid to late sixties. 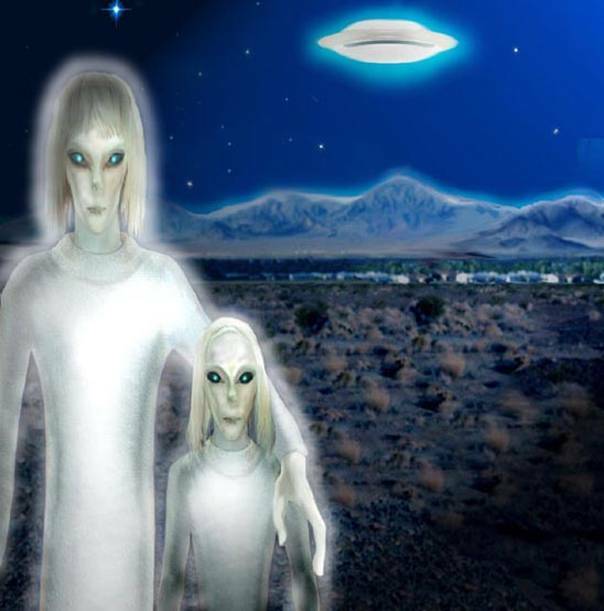 He claims that to have had many interactions with tall white extraterrestrials that looked almost human, while serving at the Indiana Springs AFB. These aliens generally are about 5'10" to 6'0" though older Whites would be taller (around 6'4"). They have a thin frail body build, chalk white skin, large blue eyes, and nearly transparent platinum blonde hair. Their eyes are perhaps twice the size of human eyes and they stretch noticeably further around the sides of their heads than human eyes do. As the Whites grow older, they grow taller, and the colour of their eyes changes from blue to pink. The Whites have a base at the Indiana Springs AFB in Nevada and assist the US Government with technology research. Bob Dean also refers to Tall Whites are one of the four species that were mentioned in the NATO Assessment of 1963. It is not clear whether these are the same Tall Whites as the ones Hall describes, since they seem to be taller (6 to 9 feet) and would have no body hair. In April 2008, 'Source A,' who leaked information about a secret UN meeting on extraterrestrials, also referred to Tall Whites as one of the races he was aware of. Note that some authors also use the term 'Tall Whites' to refer to paler coloured tall greys.